Adapted by the same man, Hayao Miyazaki, who wrote the original manga from which it is based, Nausicaä of the Valley of the Wind was the original success that gave birth to Studio Ghibli. 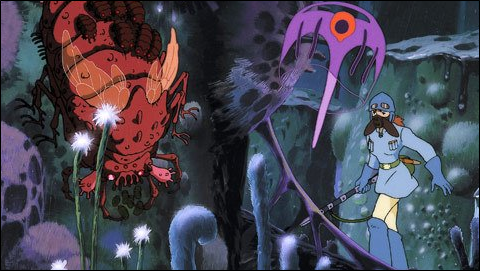 The film also set many precedents for future Miyazaki pictures: a brave heroine, flying technology, and an environmental theme. In some ways, the movie is comparable to the future Ghibli film Princess Mononoke, which is also notable for it's green Aesop. However, Nausicaä pails in comparison to it's predecessor. In the future, one-thousand years after an cataclysmic war triggered by genetically engineered Giant Warriors, the remnants of mankind live under the constant threat of the hazardous Toxic Jungle, as well as its inhabitants: giant armored insects called Ohmu. When the last of the Giant Warriors' embryo lands in the Valley of the Wind, Nausicaä's hometown, the young princess finds herself caught up in a struggle between nations in an attempt to preserve nature as well as mankind. Nausicaä herself has been called by many one of the great heroines of anime. She is brave, selfless, kind, strong, and beautiful. And boring. Nausicaä is basically the perfect heroine, perfectly embodying classic heroic traits, with little complexities to make her an engaging protagonist. Being a pacifist, the film teases the audience by implying a delve into what is hinted to be a violent second nature, but there is no development into this. Furthermore, Nausicaä is portrayed even by the film's characters as a Mary-Stu, failing to acknowledge what would sensibly be seen as shortcomings in her character, and therefore also failing to make her more interesting as one. This problem plagues many of the characters. Not to say they are all perfect, but that they are nearly all uninteresting. Unlike Princess Mononoke, which took an environmental message and made it enticing with it's grey characters, Nausicaä's fail to stand out as more than devices to service the plot and its message. These missteps are made up for in the aesthetics of the movie. One can never enough praise the art direction of a Miyazaki film. The world created here is a brilliantly exciting one. Machines with interesting designs, forests that feel both fantastic and horrible, and creatures that can induce feelings of both horror and sympathy. Visually the film is a bulls-eye, as one would properly expect. The musical score however feels dated -- you can tell this is an 80's movie. Nausicaä is by no means a bad movie. It is a good one, but also one that was clearly made before Miyazaki had truly hit his stride as a director. There is a lot to love here, but with somewhat unpolished characters, and a contrived climax to boot, the movie fails to really make an impact with the theme that it presents.